Bowl and Pitcher campground has several partial-hookup sites with electricity and water, and several with no hook ups. There is a dump station, and two restrooms both with showers. The largest site length is 45 feet, so large RVs won’t fit. Reservations can be made online. It is very close to the city, so you can eat out if you don’t want to cook. 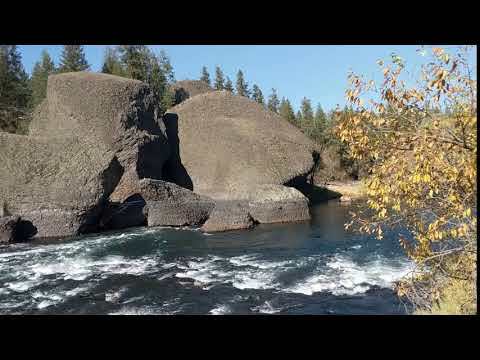 Lots if hiking trails along the Spokane River. We spent 3 weeks at Liberty Lake Regional Park while visiting our son and grandkids in Spokane. The road in is a little narrow, but once in, it’s a great little campground. Most of the sites are fairly level. We stayed at 2 different sites over 3 weeks, and both were level. They are close together! They provide a fire pit if you want one. Picnic table, water and electric. The dump station is quite a drive, back out, up the hill. There is a clean shower/bathroom building and a beach within walking distance of the campground. While we were there the campground hosts did a fantastic job of keeping everything clean and tidy. Several hiking trails, including an equestrian trail, waterfall, fishing and lots of wildlife. There were deer in the campground every day, we saw moose, owls, pilated woodpecker, and hawks. We were there over July 4th weekend and they had a fireworks display on the beach. Wet and slippery, wear comfortable shoes! This location is closed. But check out the one in CO next time you're in that area! This is a larger campground great for RV, trailers and tents. The sites are enclosed in a circle, making a nice walk or bike ride. The campgroundl has partial hook ups and is very camper friendly otherwise. Sites are pretty open not offering a good amount of privacy, though most are along the Spokane River. Each site has a picnic table and fire ring, with bbq grate. The site has showers and flushing toilets!! This is a perfect getaway for people looking to unplug as no cell service (tested on sprint, verizon, and google fi) is available. There is tons of wildlife and lots of trails and riverbank to explore.my favorite thing was the suspension bridge over the river. Lots of space for swimming and fishing! This is a great stop point before getting into Idaho. The campground was very well maintained and great to stay at. It is located in between Spokane proper and Coeur d'Alene (so Spokane Valley). There are tons of spots to choose from, but it gets pretty busy in the summer. The cabins were great and had everything you needed to get by. There is a laundromat, store, sports area, lots of space for dogs and a game room at the main lodge. I really liked the community fire pit since there wasnt a fire pit at each site. One cool thing about this site is they have "gazebo sites" for RV campers. They also have an outdoor movie theater set up, but we werent able to take advantage of that perk. We were able to drive a short way to Lake Coeur d'Alene for their Fourth of July events and even rented a lake boat for tubing. Great site for families, RVers, and pet owners. I enjoyed my stay at Hawk Creek. There are plenty of places to fish and swim. We camped close to the Falls so we had a nice view from our campspot. We stumbled on this resort because they were on the Passport America list. They are NO longer a passport America park as they are under new ownership. Nice large campsites, beautiful swimming area and cute little store and breakfast restaurant! Beautiful star-y skies and lots of deer at night!!! No fire ring at the site, there are picnic tables and we had a full hookup site! Staff was super friendly. Dog friendly! Right off the highway, on lake roosevelt. 18 dollars a night. There are fire rings, picnic tables and vault toilets. All short walk in sites. Access to water, great for kayaking. Trains! There are trains all day and night! Sites were narrow had to ask a fellow camper to move his truck was very difficul to manuver the camp ground streets Large beautiful trees Facilities were clean Laundry was adequate Dog poop everywhere! We clean up after our pets this was crazy…. Breezed in on Labor Day weekend so I just hafta start by saying how grateful I was to find anything. This place is clean, folks were friendly, etc. All good stuff. I'd say it's primarily for the RV/Family crowd, but there were other car/motorcycle campers there, too. There's a little store and a nice community camp fire. I think this place is just great as long as you think through its proximity to the freeway, etc. It definitely made for a quick coffee run into CDA in the AM. For this being our first long distance trip from Boise, I’m extremely glad we stayed here. The scenery is gorgeous within the park (lots of trees and grass areas), excellent for dogs and the site we stayed in was perfectly level from the time we pulled in. Unfortunately our water heater wasn’t working so we had to use the showers on site and I was not disappointed, they were about 9/10 on cleanliness but water temp/pressure was excellent. WiFi was better than what I would have expected. Staff at check in was very friendly and courteous. It’s convenient that it’s behind a gas station because if you need any snacks, drinks or propane it’s just a short walk away. The only negative that I have to share is that the train is just on the other side of the highway and for whatever reason they enjoy blowing the horn and I will warn you this could happen at any hour of the day/night. We were in the back end of the park so it wasn’t completely drowning but you definitely know it’s there. If our travels ever bring us up this way again, I will not hesitate to stay here again. My family has been going to this campground and area since before I was born. We used to go every summer growing up. There's a designated swimming area for kids, a dock, and a playground. Definitely a busy spot mid summer season, but good for the whole family. Lots of boats of the lake, good for water skiing or wakeboarding. A bunch of smaller, more quiet and secluded beaches nearby. The trains can sometimes be annoying but fairly quiet at night, it hadn’t been that bothersome. with everyone having slide outs now it makes the sites close, so no fire pits in the general camping area!! They have the upscale sites and you can have a fire there. we stay here a lot as they are open year round. This RV park is more of a place for people to live, than a campground. Most people in this campground live here in their campers. They have a small grassy park area, and are on the outskirts of town (Spokane). Little worry of people wondering through, however all the sites are very close together with no personal grass area to speak of. Definitely a campground ⛺ for those who want to spend their whole day at the park 🎢across the street. There is nothing to do in the campsite, however if you are planning to spend the whole weekend at the park 🎡 then it is the perfect place to stay. Close to town 🌆 this Park is nice to get away for the day. I love the swinging bridge 🌉. However camping 🏕 here is very simple with basic facilities and the campsites all in the dirt. A great place to hike 🚶but not my favorite campsite ⛺. Safe campground, nice and courteous staff, clean property. Amenities include bath house, laundry, and game room. Tent spaces are very spacious. Small campsite ⛺ on the edge of town. Perfect for a few nights relaxation. Hot showers 🚿make for a relaxing night after a day on the river ⛵. While there is no hiking here, it is close to nearby forests 🌲. With it's own boat dock ⚓ you can spend the night fishing before sitting around the 🔥. Great for someone who wants a simple campground. A small campsite ⛺ near Old Town, my family spent a weekend every summer ☀here when I was a child. We would get a first come site and spend our time fishing 🎣 and enjoying the campfire 🔥 Close to town it's easy to run to the store. While the campground is small, it's close to several forests 🌳 you can go hiking in, or go boating 🚣 and kayaking 🛶 on the river. We would also drive to Sandpoint to spend the day in town. Definitely a cute campground ⛺ to relax in! This place has it all! Showers, weekend breakfast, a store, a kayak launch, you name it. This is a great place to come with your family and enjoy a day on the lake. They have big roomy sites and lots of lakefront. Only spent one night, but it was a great spot. It's a primitive camping spot so you'll need to bring water. The campsite is right along Banks Lake and is super peaceful. I immensely enjoyed the crickets and frogs as I was falling asleep. ….The Campground and RV Park, located on Sprague Lake, just 36 miles west of Spokane, WA along I-90 and only 2 miles out of the town of Sprague, on a quiet paved road. (See our map) We are normally open from the 1st of April to the end of November. ….At Sprague Lake Resort, you can enjoy some of the best shore Fishing on the lake. The Resort is surrounded by springs that make this THE dock fishing spot for big (and tasty) Trout, Steelhead and even Bass. Sprague Lake is also known for it's big Channel Cats! ….If fishing isn't your thing, you can Camp or just picnic and relax under the big old Cottonwoods that shade our park. Bird watchers can enjoy sightings of White Pelicans, Meadowlarks, Cormorants, Loons, Wood Ducks and many other species. ….In our park under the trees, we have plenty of tent camping space and 31 full service hookups for your recreational vehicles. The endless shoreline offers a wonderful view from every RV or Camping site.